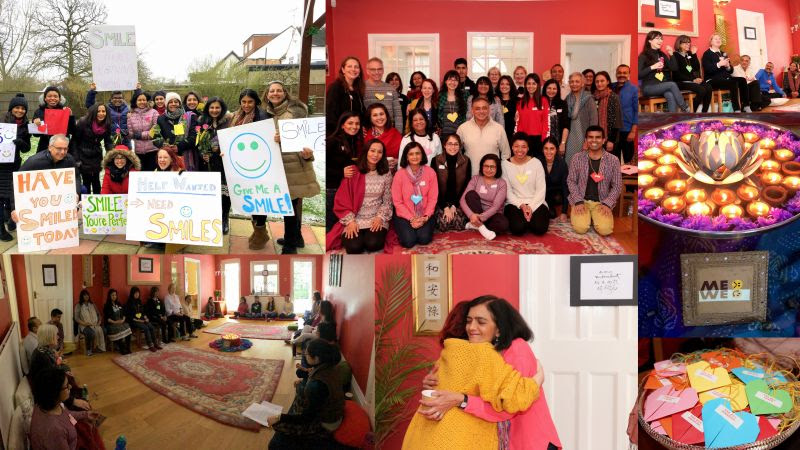 Every retreat is uniquely co-created through each person’s presence, so thank you for saying yes and bringing your most authentic self to the circle as we collectively explored how to nurture small shifts in our hearts “From Me to We”. Anya beautifully summed it up in her opening share, “It’s not just about CREATING community but ACCEPTING community to start with. Accepting that ‘me’ has been a part of ‘we’, all along.” We are so grateful to the many hearts and hands who contributed to this retreat in so many wonderful ways — as Mita shared afterwards, the co-creative nature of our day together created a whole that was far greater and more beautiful than the sum of its parts. To support each of us in carrying forward the ripples of inspiration from the retreat, we have included a few inspiration-to-action ideas here below, through which you can engage your head, heart and hands to continue to go deeper. Meditate and Reflect: Weekly Awakin Circles happen in four locations around London, you can check this page any time for upcoming dates and RSVP to join. In addition, you can find another space for silence every week at the Museum of Happiness for their Friday Mindfulness Meditation gatherings, find out more and sign-up here. Join a 21 Day Mindfulness Challege: We’ve set up a 21 Day Mindfulness Challenge so that together we can tune into the magic in mundane moments and cultivate a deeper sense of awareness of our interconnection. Find out more and register here to join this challenge which starts on March 30th — you’ll receive a new prompt in your inbox each day and we can all share reflections in our private group online! Subscribe: If you’d like a bit of positivity and inspiration delivered to their inbox, ServiceSpace offers a variety of newsletters as a pure labour of love, which are also 100% volunteer-run projects and commercial-free. Check out this page for a full list and subscribe to any that inspire you! 🙂 For eg., DailyGood is our oldest running newsletter, which has been sending out positive news *every single day* for over 20 years! We are deeply grateful to each of you for sharing your whole-hearted presence and look forward to seeing you at an upcoming gathering soon!